Morning everyone! Just a simple errands outfit for you. This is what I was wearing when I missed the Jewelmer event because of some important errands I had to finish in Paranaque. Life has just been real hectic lately. I find myself always rushing to accomplish task A to Z then rushing to make it on time from point A to B. I am thankful for the opportunities but I just need time to adjust. I miss my daily "blog walks". 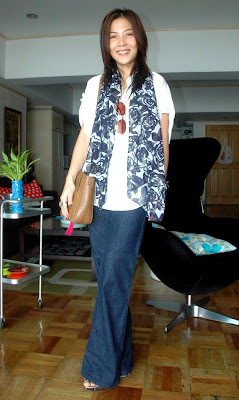 In this post, I am wearing wet hair, a loose top from summersault, a scarf from greenhills, ray ban aviators, topshop bell bottoms, accessorize bag, and aldo shoes. Today I'll be judging a "Recycled and Upcycled" fashion show. I'm so excited! I can't wait to show you pictures of the event. I'll try to tally the entries for the chicify contest tonight so I can announce the winner by tomorrow or the next day. Thanks for bearing with me! If you want frequent updates, feel free to add me on twitter. I've yet to show you what I purchased from the Bloggers United Bazaar. I was able to score some really nice items from Kate Torralba, Bestie and Rosana Aranaz! Lovely outfit!! It's sooo pretty!! so casual and chic! you look great! Very cute, casual look! I love the pants! I'm also looking forward to photos from the fashion show! You look adorable! Have a wonderful afternoon!Can't wait to see the pictures from the Recycled and Upcycled fashion show! Awesome look! Im loving every single item of it! I'd totally wear it for errands too or college! 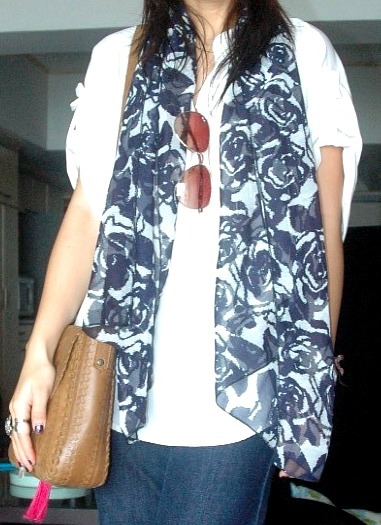 Love the outfit - very cute and summery!